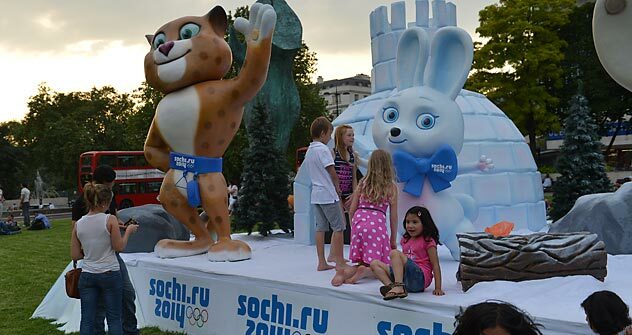 Two ambitious Russian-themed areas are opening in London’s Kensington Gardens to coincide with the London Olympic Games. The 10,000-square-meter Russia Park will feature a live stage, open air arts-and-crafts galleries, “roaming performers” playing different kinds of Russian music and traditional cuisine, including the classics: shashlik (kebabs), pirozhki (pies) and blini (pancakes). The superlatives are out in force here too, with organizers threatening the largest-ever display of Russian culture in London. And, of course, visitors can watch the Olympics live on big screens throughout the parks. The excitement kicks off with a party during the screening of the opening ceremony on the evening of July 27. Onofrei stresses the family-friendly nature of the parks. The organizers are planning all-day entertainment for kids and Onofrei notes that children might play in the sports’ area, with its mini ice rink, while their parents relax in the picnic zone. And, in contrast to the manic energy of the screened and live performances, there are free yoga classes every morning. The idea of the parks is partially to provide a more complete picture of Russia to those attracted by one particular aspect. For instance, “if people come for the rock festival and as a result get a better picture of Russia as a whole, that’s our mission accomplished,” Onofrei said. She herself is excited to meet some of the visiting celebrities, and hopes that even Russian President Vladimir Putin will put in an appearance at the parks when he comes in a private capacity to watch the Olympic judo. All kinds of choirs and theater companies are scheduled to appear on stage, including participants from this year’s Red Rocks music festival. Acts will include the popular band Mumiy Troll from Vladivostok and rock legend Garik Sukachev. Meanwhile the “House of Russia Hospitality Center” has attracted a series of big conferences. The center will be hosting this year’s Russia Investment Roadshow, which boasts an impressive list of visiting CEOs, a gala dinner and the glamorous Moscow Motion party. House of Russia is also hosting the global Sports Industry Congress, which was first held three years ago in London and is focusing on Russia this year, which is hardly a surprising decision with the the Winter Olympics and Grand Prix coming up in 2014 and the World Cup in 2018. Sochi Park will be importing the “beauty and spirit of the Russian winter” with an ice dance spectacle called “Sochi: Small Stories of a Big City.” The show is set to involve six Olympic and 18 world figure-skating champions, as well as dancers, acrobats, 250 handmade costumes and seven tons of props. Next door, the Sochi visitor experience Pavilion offers a virtual chairlift ride and skiing trip through snowy mountains.